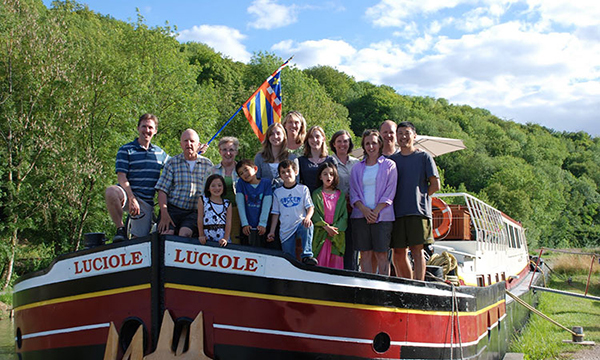 Luciole, a longtime Barge Lady favorite, is family-owned and is known for an extremely warm onboard atmosphere, delivering a classic and quintessential Burgundy barge cruise. 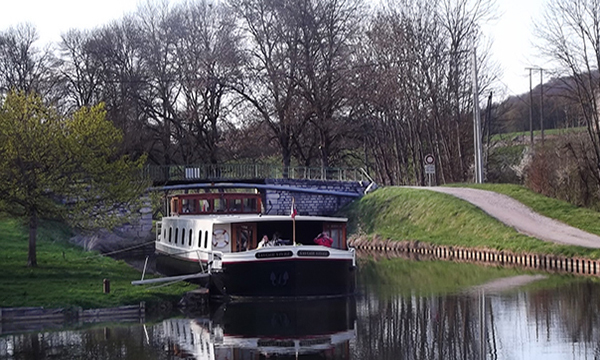 Setting the standard for 3-star barging, the Luciole cruises on what is arguably the most naturally beautiful route, gliding on the divinely beautiful Canal du Nivernais between Auxerre and Clamecy. The Luciole serenely cruises past rustic lock houses, magnificent sweeping views of French landscapes, and breathtakingly grand rock formations as part of the surrounding scenery. Here, the abundant wonders of Northern Burgundy beckon for exploration with exhilarating bicycle rides or leisurely strolls along the miles of manicured towpath. Guests relax on the expansive deck to admire the passing panoramas, perhaps while enjoying a glass of wine provided by the attentive crew. A newly refurbished salon and recently updated bathrooms provide the most comfortable of accommodations. The only vessel in the Barge Lady fleet with cabins exclusively for solo travelers, the Luciole appeals to all manner of wayfarers and wanderers with a shared love of adventure and exploration! Food and wine is another cornerstone component of the Luciole’s classic cruise experience. Breakfast buffets, light lunches, and beautifully presented multi-course dinners appeal to even the most exacting of gastronomes; the wine list showcases the splendid Burgundies for which the region is celebrated. Burgundy’s history comes alive by exploring a preserved medieval village, touring and tasting at a private winery deep in the vineyards of Chablis, and visiting the reconstructed church of Auxerre with its vibrant display of stained glass windows. Barge Lady Stephanie cruised in 2014; see her fabulous blog for more details! Watch this fabulous video to learn more about life aboard the barge Luciole. In the afternoon, you will be met by a crew member of the Luciole at the designated meeting point. From here, relax as you are chauffeured to the Luciole, moored in the town of Auxerre. A traditional champagne welcome and introduction to the crew awaits you, before your first gourmet dinner onboard. Explore France's rustic charms with a leisurely stroll or gentle pedal on the towpath as this morning's cruise glides along the River Yonne through pastoral countryside. In the afternoon, your Tour Guide chauffeurs you to the iconic vineyards of Chablis. Here, meet the viticulturists who expertly grow the pampered grapes from which this white wine is exclusively produced. Samples of the vineyard's vintages are of course offered! Upon returning to the Luciole, enjoy cocktails on deck as Chef prepares another gourmet dinner. Enjoy a coffee on deck and admire the passing scenery during this morning’s cruise, or explore the towpath by bicycle or on foot. Today your Tour Guide escorts you to the city of Auxerre. Located on the banks of the River Yonne, this historic town was first settled by the Romans, and boasts a Cathedral, an Abbey, and a Church. Known for intact Medieval buildings, this is the ideal place to stroll along cobblestoned streets, browse the boutiques, or enjoy a cafe in the town square. Tonight, cocktails and dinner are served onboard. Your Tour Guide escorts you this morning to a local market in the village of Noyers. A study of modern life thriving within 15th century Medieval architecture, residents are proud that Noyers has been officially designated as one of the prettiest towns in France. Taste handmade cheese, discover the old ramparts, and admire the intact half-timbered buildings. After lunch ashore, return to the barge for an afternoon cruise. The miles of manicured towpath beckons for a leisurely stroll or a brisk bicycle ride. Another gourmet dinner is served onboard. This morning's excursion is to the hilltop town of Vezelay, one of Burgundy’s most beloved treasures. A vast view of the surrounding countryside awaits! Both the town and its 11th century Romanesque Basilica of St.F Magdalene are designated UNESCO World Heritage sites; Vezelay Abbey was also a starting point for pilgrims on the Way of St. James to Santiago de Compostela. After your tour, browse the village's shops and boutiques. Return to the barge for a lazy afternoon cruise. Relax with cocktails and dinner onboard. Start the day with a tranquil traipse or a gentle pedal, or relax on deck with a cup of coffee or tea. This afternoon, your Tour Guide escorts you to the Chateau of Bazoches, originally built in 1180 by Jean de Bazoches. Since 1675, it has been owned by many families and dynasties. Intriguing architecture abounds; the trapezoidal-shaped feudal castle comprises three round towers and a rectangular keep. Afterwards, your Tour Guide will return you to the barge for a festive cocktail hour and the Captain’s Dinner. In the afternoon, you will be met by a crew member of the Luciole at the designated meeting point. From here, relax as you are chauffeured to the Luciole, moored in the town of Auxerre. Welcome aboard, Adventurers! A traditional champagne -- or soda! -- welcome and introduction to the crew awaits you, before your first family dinner onboard. This morning's cruise allows time for bicycling or walking on the towpath, or just relaxing on deck. Afternoon excursions begin at Guedelon, a modern day castle construction site using only techniques and materials found in the Middle Ages. When completed in the 2020s, it should be an authentic recreation of a 13th-century chateau. Afterwards, visit an outdoor park for family fun with zip-lining and tree climbing. All activities are of course optional. Return to the Luciole in time for cocktails (or mocktails!) and dinner. Hop on bicycles this morning, and see if you can beat the Luciole to the next lock during this morning’s cruise! Those who prefer a more relaxed pace can of course laze on deck. This afternoon, your Tour Guide escorts you to one of the most anticipated activities -- horseback riding! For those of you who wish to remain on your own two feet, a visit to the lively town of Auxerre offers shopping and culture. Back onboard, Chef presents another festive family dinner. Your Tour Guide escorts you on a morning excursion to a local market in the village of Noyers. Taste freshly made cheeses, discover the old ramparts, and admire the intact half-timbered buildings. Then, visit what was once France’s largest chateau, at which volunteers are now reconstructing the castle's towers. After lunch ashore, an afternoon cruise is the perfect time for bicycle rides on the towpath, or join Captain Francisco in his wheelhouse and help him steer the barge! Chef presents another fun family dinner. This morning's cruise meanders through a region of dramatic cliffs; footpaths up to the top promise vast views of the expansive countryside. This afternoon, your Tour Guide escorts you to an old stone quarry specially adapted for rock wall climbing. Different routes for novice or advanced climbers ensure the courses are appropriate for any skill level. For those who prefer "terra firma" today, an onsite cafe provides the perfect perch to participate in the fun. Head back to the Luciole, where Chef is whipping up another dinner. Luciole's final morning cruise gently plies the canal, enticing guests for one last gentle pedal or leisurely stroll. 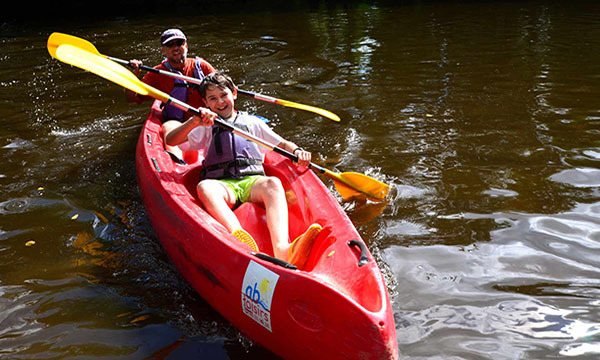 Then, get your life jackets on as your Tour Guide takes you kayaking on the River Cure, where thrill seekers will paddle right under an authentic Roman bridge. For those who prefer to be landlocked, an escorted excursion to the UNESCO Heritage town of Velezay offers history, culture, and shopping. Back onboard the Luciole, Chef is putting special touches on tonight's celebratory dinner. Be prepared for toasts by and to the crew! Explore the serene scenery and rustic charm of Northern Burgundy via guided bicycle expeditions of varying duration and difficultly levels. Expeditions are professionally customized, ranging from 15-30 miles per day, and the bicycles have 21 gears for personalized speed and optimal agility. Gourmet picnics, prepared by the barge’s chef, will be supplied, and a highlight of the bicycling itinerary is an epic ride through France’s stunning Morvan Forest National Park. In the afternoon, you will be met by a Luciole crew member at the designated meeting point. From here, relax as you are chauffeured to the Luciole, moored in the town of Auxerre. A traditional champagne welcome and introduction to the crew awaits you. You will have time for bike fittings and to take one for a spin before your first gourmet dinner aboard. The adventure begins with a morning cruise, with ample time to cycle along the towpath, or just relax on the deck with cup of coffee and watch the scenery slip by. 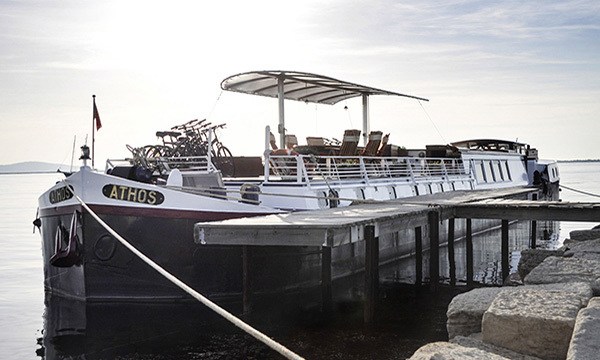 Upon mooring, your cycling guide leads you on a 15-mile ride to Chablis for a winetasting, biking through Burgundy's beautiful vineyards and charming towns. Swirl, sip, and savor the world-famous white wines for which Chablis is celebrated, and then return to the Luciole by bus or bicycle, where a well-deserved cocktail hour awaits! Meanwhile, Chef is crafting tonight's gourmet dinner. Choose Your Own Cycling Adventures Today! Greet the day with a 21-mile morning cycle, following the road up to the wine village of Coulanges-la-Vineuse. Pinot Noir grapes are grown here in abundance, with a few Gamay and Cesar vines remaining. Return to the Luciole via bus or bike for lunch and an afternoon cruise. Relax on deck with a glass of wine and admire the scenery, or socialize in the salon with board games and cards. After mooring for the day, visit the historic center of Auxerre, or cycle an 11-mile loop from Accolay via Bessy-sur-Yonne. Another gourmet dinner is served onboard. 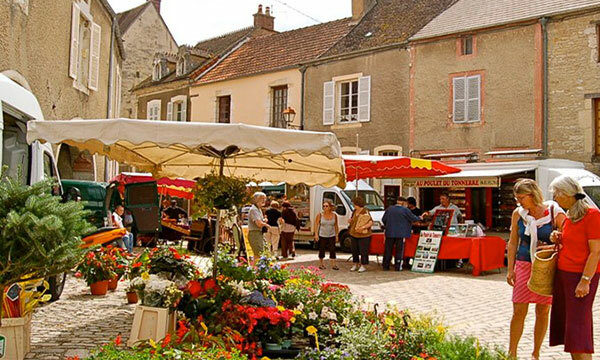 It's market day in the pretty town of Noyers-sur-Serein! Cycle a 10-mile route to this charming village through some of Burgundy's most scenic paths. After exploring the lively market and delightful shops in Noyers, enjoy a special lunch ashore before returning to the Luciole by bus, or bike back for another 8-mile tour. 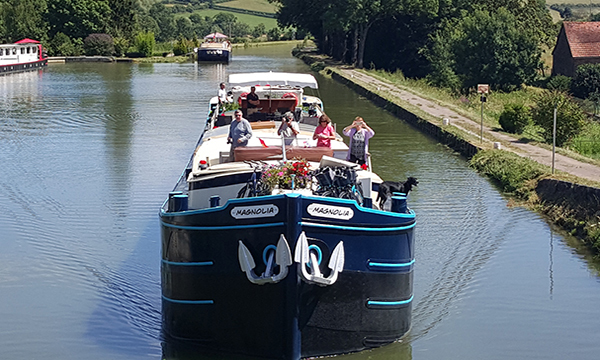 An afternoon cruise is the perfect time to laze on deck with a glass of wine, or, if you prefer additional cycling, enjoy the loop via Tracy-sur-Yonne and rejoin Luciole further along the canal. Drinks and dinner onboard. The day's activities begin with a morning cruise, or, an optional cycle ride up into Mailly-le-Chateau before catching back up with the Luciole along the canal. After lunch ashore, a 10-mile afternoon cycle to Vezelay culminates at the 12th Century Basilica Mary Magdalene, a beloved landmark of this charming hillside village. 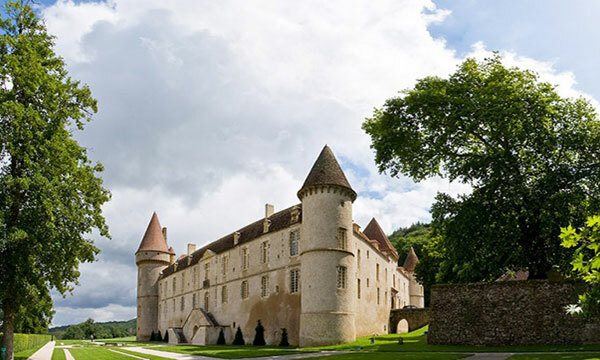 Return to Luciole by a 15-mile bicycle ride, or take the bus for an added tour of the Chateau of Bazoches, an architecturally significant estate with a fascinating familial history. Cocktails and canapes onboard precede dinner. Begin the day with a 13-mile optional solo cycle, joining the Luciole further along the towpath. Those wishing to remain on two feet instead of two wheels can relax on deck, or take a guided tour of the chateau of Bazoches. Today's excursion is a private tour of the grounds and gardens at the Medieval chateau farm ‘La Chartreuse’. Return to the Luciole, where a 14-mile afternoon cycle along the Nivernais Canal offers a final immersion into Northern Burgundy's expansive natural beauty. Back onboard, your Captain joins you for tonight's special Farewell Feast! Your “Chocolate Chaperone” joins your “Femmes in France” party at 10:00 am in the lobby of a designated Paris hotel. From here, your group will be escorted to three gourmet chocolate shops in the Right Bank for indulgent samplings of the finest cocoa confections in Paris. Meet local chocolatiers who reveal the secrets as to how these evocative concoctions are expertly and passionately created. At 12 noon, this tastiest of tours is completed. Enjoy the rest of the day to explore the many other pleasures of Paris. In the afternoon, you will be met by a Luciole crew member at the designated meeting point. From here, relax as you are chauffeured to the Luciole, moored in the town of Auxerre. A traditional champagne welcome and introduction to the crew awaits you, before your first gourmet dinner onboard. The adventure into the heart of Burgundy begins with a morning cruise. Relax on deck, or explore the towpath by bicycle or on foot. Then, Chef invites you into the galley for a cooking demonstration, where the secrets of modern French fare are shared. This afternoon, your Tour Guide escorts you to the iconic vineyards of Chablis. Here, meet the viticulturists who expertly grow the pampered grapes from which this white wine is exclusively produced. Swirl, sip, and sample! Cocktails and dinner are served onboard. A lazy morning cruise begins the day. Your festive adventure continues with a visit to the lively town of Auxerre. Located on the banks of the River Yonne, this small city is the ideal place to stroll along cobblestoned streets, browse local boutiques, or enjoy a cafe in the town square. Back onboard, a professional color and style consultant from Paris visits the Luciole to ensure everyone's wardrobe has that French "je ne sais quoi". Meanwhile, Chef is putting the finishing touches on tonight's gourmet dinner. Your Tour Guide escorts you on a morning visit to a local market in the charming village of Noyers. Taste handmade cheeses, browse the craft shops, and enjoy a coffee in the town square. Burgundian bliss continues this afternoon! After lunch ashore, a visit to the Priory Spa promises one of the most anticipated excursions of the cruise. Unwind with a massage, relax in the sauna, and enjoy the good life! Upon returning to the Luciole, an evening stroll or pedal on the towpath completes the day's permissive activities. Drinks and dinner are served onboard. This morning your Tour Guide escorts you to the Chateau of Bazoches, originally built in 1180 by Jean de Bazoches. Since 1675, it has been owned by many families and dynasties. Intriguing architecture abounds; the trapezoidal-shaped castle comprises three round towers and a rectangular keep. This afternoon, a visit to a private garden delights the senses! Take tea and cake with the owners, and enjoy a tour of their beautiful grounds. An early evening cruise precedes another gourmet dinner. Laze on deck during this morning's cruise. Manners are minded with a napkin folding lesson from the barge Hostesses; secrets to the most dazzling of table settings are revealed! Later, your Tour Guide escorts you to the hilltop town of Vezelay. Both the town and its famous 11th century Romanesque Basilica of St. Magdalene are designated UNESCO World Heritage sites. After your tour, browse the craft shops, specialty boutiques, and artisan galleries. Back onboard, a celebratory "Femmes in France" dinner awaits.